If your kitchen is on the small side, it’s easy to be overwhelmed, and it might feel like you have more stuff than space, but the key is to maximise the space you do have. Take a look at our kitchen storage ideas to give you a little push in the right direction. These days there’s a gadget for everything, and if you have a custom utensil for every task it can get too much for your kitchen in no time. Be ruthless – when was the last time you even used that melon baller? By only keeping the things that you really need, you’ll make it much easier to organise your space. And why not donate your old things to your local charity shop? Make your storage facilities work harder for you by investing in a few little bits to make the most of your available space. 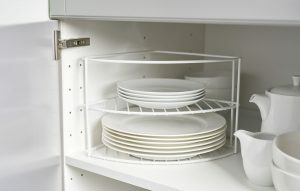 Check out our smart storage range for lots of little hacks to help get your cupboards in check. We love this corner plate rack, which will make short work of neatening up your plates and bowls and makes it easy to grab the one you need without causing a crockery landslide. For really tiny kitchens, look at collapsible accessories which can be easily stored away when they’re not in use. Our collapsible bucket folds down to just 5cm tall, so it takes up very little space, and there’s a hole in the rim so you could even hang it on the back of a cupboard door. Perfect! Reclaim dead space with smart storage ideas. If space in your cupboards is tight, think about wall storage or over door storage as a smart way to organise your room. 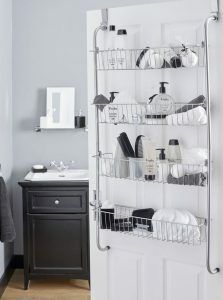 An over door rack turns the back of any internal door into a handy storage space, keeping everything tucked away, but still within reach when you need it. And while you’re maximising the space inside your cupboards, why not think outside the box and use the space outside them with this handy over door towel rail. It’s no good getting everything in order if you then can’t find it again when you need it. Allocate a place for all your things, and put them back in the right place when you’re done with them so you always know where they are. 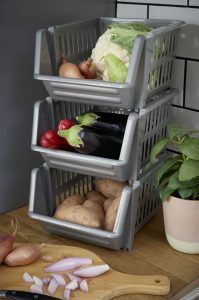 Use stacking baskets to organise and tidy in a snap – keep different types of snacks separate, or sort out your cleaning supplies so you can always grab what you need in a hurry without having to empty every single thing first. Or why not add our carrier bag holder to the inside of one of your cupboards? Whether you re-use them when you go shopping, or re-purpose them as bin bags, it’ll help keep the mountain of spare bags in check and keep them all neatly in one place for the next time you need one. Got any handy hacks or top tips for kitchen organisation? Let us know on Facebook,Twitter or Instagram!